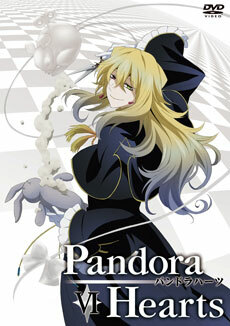 I have wished to make this into one of my Manga vs. Anime reviews, however, the manga is taking quite too long to finish and I was quite excited to write about this exact show, so here I am – doing my Pandora Hearts review of the animated television series. Just don’t be too surprised if this turns out to be a manga and anime review at the same time. Fantasy, daemons and a different view of Alice in Wonderland are entwined in this quite good manga by Jun Mochizuki. Personally, the anime came to me as a life-saviour at a time I was craving my weekly dose of Japanese animation. I was very pleased with the overall story of this fantasy story that is engulfed by mystery. It has very nice animation and graphics with quite charming characters, however, it is definitely not an anime that can top someone’s list. As a matter of fact, I am getting more bored with each next chapter of the story which is mainly turning into an odd romantic one in both the past of Alice/ Lacie and her current life. Moreover, the extremely awkward relationship between Oz Vesalius and Gilbert Nightray is put aside for the efforts of the mangaka to make the first ever heavy romantic story in recent manga history – it just doesn’t work. The good thing about Pandora Hearts as a whole is the awkwardness of these two characters and the unknown force that one can imagine while thinking over what the Abyss and the other Alice hides within it. However, with the progress of the story, we get to see that everything becomes flatter and flatter with many characters changing for the worse. A good example of this is my favourite character Break Xerxes. By the time the manga reaches some action and development, he becomes this very damsel in despair thing I was talking about. Truly stupid and cliché is to make a strong and unique character into a suffering one like those from the Latin soap operas from the end of the last century. Enough with the manga, I said I won’t be doing a manga versus anime comparison now. The anime itself is very nice and pleasant to watch. Its serves the viewer with a very nice look at the Alice in Wonderland story and puts the whole reality through its own mirror. I really liked this thing. The graphics and the styling of the characters is incredible and I am even jealous of the great clothes the men in this show wore all along. The females can be an inspiration for the cosplayers too. Moreover, the powers that the chains give and execute are just incredible. All I have to wonder is why… what has happened to the great mind and imagination of Mochizuki-sensei. The final scenes of this show were fast-forward and quite illogical. But it is not surprising at all, especially having in mind the fact that the manga was not developed when the show got to its final episodes. However, I can say that it all worked out somehow unlike in some shows such as Soul Eater. At the end of the day, Pandora Hearts is a nice anime with cool characters and a bishounen heaven. There is also a cute girl who likes to nom others’ cheeks and is actually an evil black rabbit. It is an anime that is unlikely to ever become big and it is a deserved fate, however, if you don’t have what else to watch and are a fan of either bishounen characters and/or fantasy anime based on Lewis Carroll’s books – it is without a single doubt the right choice for you. There is some kind of action… in the middle of the show itself. It gets intensive and then, since it reaches the manga (probably) goes absurd and finished even less coherently. Thanks! I’ll check it out then. I actually prefer the anime to the manga. Maybe because it ended. I mean,…I believe the mangaka just doesn’t know how the story should end and prolongs the character’s life with no need. I am also with you on this. I think I said it somewhere that the manga just doesn’t want to end! It’s dulling and dulling and being everlasting like a soap opera. Going to your review, it’s nice! Thank you very much! I am happy fans read my reviews and give me feedback. When it’s officially over I will probably edit this review. What a stylish, well-measured and accurate review, Shinigami-sama. Thank you for it. What about her alter-ego? The white Alice?